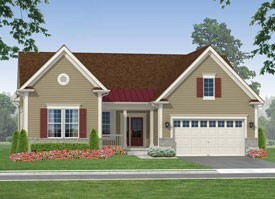 THE HOPE - Starting from $331,900 3 - 5 Bedrooms / 2 - 4 Bathrooms / 1,838 - 3,879 sq. ft. Crisp, balanced design sets the Hope apart with a plan that suits both entertaining and relaxing. A traditional foyer opens to a large great room, which leads into a generous country kitchen with an expanded, wrap-around island and a sunny breakfast area. In addition to the luxurious owner’s suite with walk-in closet and private bath, the Hope offers two additional bedrooms. This floor plan offers the option to expand to the second floor by adding a loft, bedroom and bath for a guest’s retreat, or simply for additional living space. Square footage from 1,838 to 3,879. Starting from $331,900.